It is an informational website having information about trading. The website will consist around 31 web pages. In this website users can navigate to the home page with containing several different tabs in header such as “Forex Trading Tab”, “Partnership Tab”, “Online Trading Tool Tab”, “About Us” and “Customer Support Tab” and footer section over website. User can click on any tab to navigate to inner pages of respective tab. users will be able to view information present over the site. Users can download PDFs present in “Download Page”. User will be able to send inquiry or any question to admin by filling contact us form. Admin can add / delete pages and can change the text contents in the pre-defined positions using the editor provided in Content Management System. Admin can upload PDF over the site. They can send bulk mails for the latest news to the users which have subscribe newsletter via Mail-chimp over the website. Website will be multilingual having three languages such as English, Chinese and Japanese. 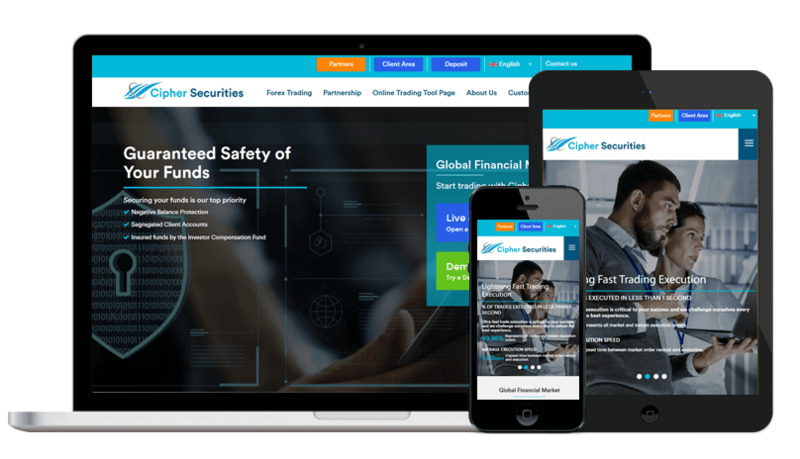 Why They Chosen Us :cipherforex has chosen us for our ability to develop complex website and providing efficient solutions with logical approach to the requirements. The website has only single version that is running successfully from the date it was released.